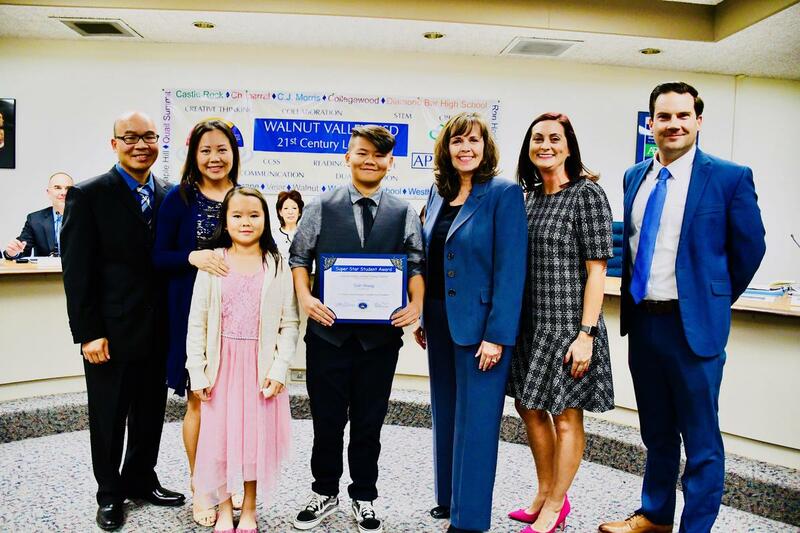 WALNUT, CA- In keeping with tradition, the Walnut Valley USD Board of Trustees honored outstanding students and community members during the November 14 meeting. 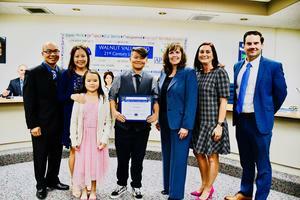 Suzanne Middle School 8thgrader Tyler Hoang received the Super Star Student Award. Tyler is an outstanding student and campus leader involved in service organizations and a schoolwide broadcast. He is known as the “face” of Suzanne conducting interviews each week during the SMSFilms news program. Tyler demonstrates support for his school and community by participating in two service clubs on campus. Conservation Club members pick up recycling each week and host an annual beach clean-up. The CARE Club recently collected 743 pounds of candy to be donated to the Los Angeles Mission. In December, members will collect holiday gifts for Toys for Boys. Teachers describe Tyler as a “go-to” student who is dependable, reliable, and hard-working. “Tyler possesses leadership skills far beyond what some might expect from an eighth grader. He really captures the spirit of a Suzanne Challenger!” said Principal Dr. Amy Smith. Deputy Sheriff C.T. McDonald was lauded with the Partner in Education Award. “Deputy McDonald has worked with administration, teachers, students, and parents, providing insight and knowledge to support our school,” Dr. Smith said. He recently worked with teachers to help familiarize them with the Run, Hide, Fight safety plan. Deputy McDonald has also been vital in creating smooth drop off/pick up routines to assist with traffic flow and student safety. “He has been such an asset to our school! 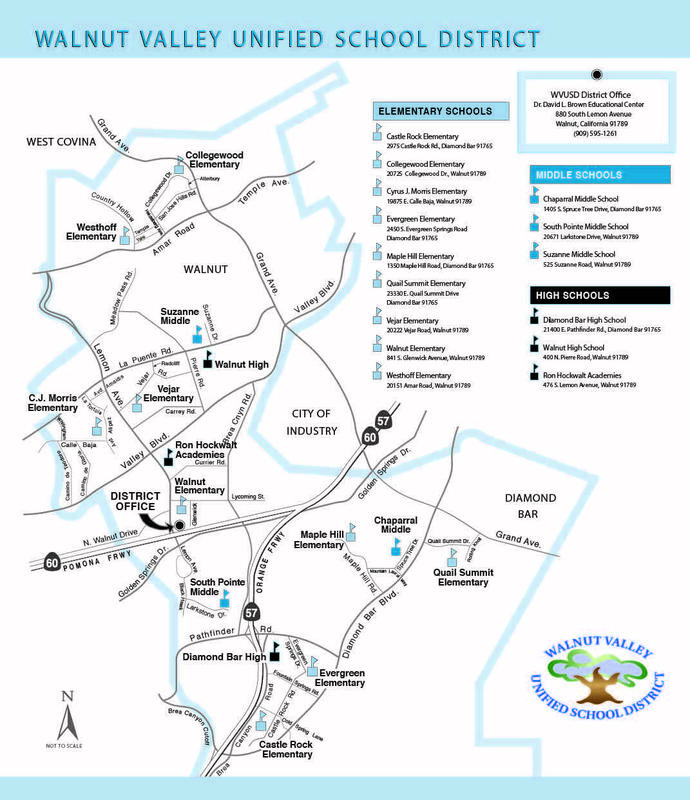 You will often find Deputy McDonald directing traffic and reminding parents about safety and rules of driving,” Dr. Smith said. Deputy McDonald has met with students and parents on a variety of concerns and has a personality that puts students at ease. C.J. Morris Elementary fifth grader Larissa Topete received the Super Star Student Award. 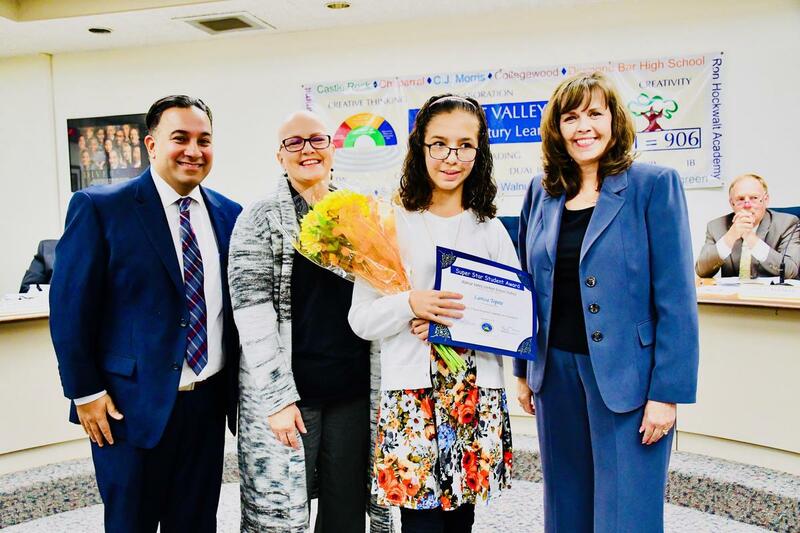 Larissa was shy and quiet when she came to the school’s ASRD (Autism Spectrum & Related Disorders) class as a third grader, but she had a desire to make friends and try her best. “Success is determined by perseverance and determination and we consider Larissa a true success story!” said Principal Shehzad Bhojani. 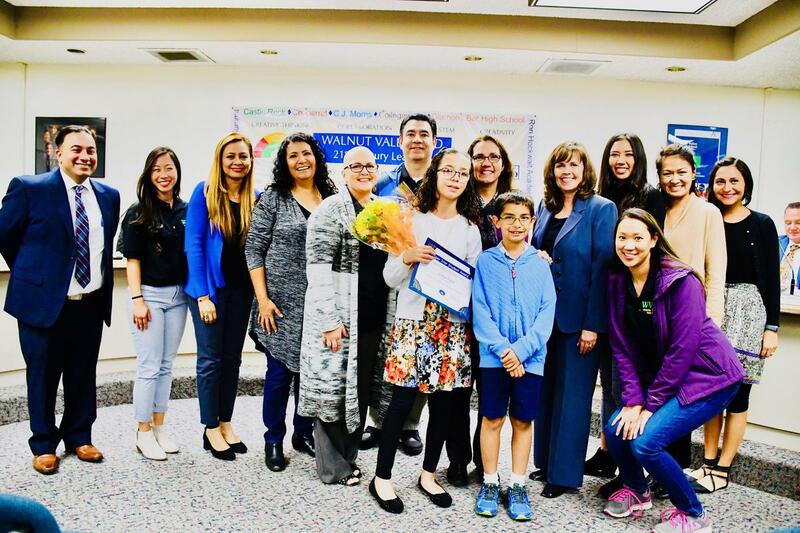 She is well-rounded, loves learning Spanish, is a member of the school choir, track team, Matador club, and has participated in several Reader’s Theaters. 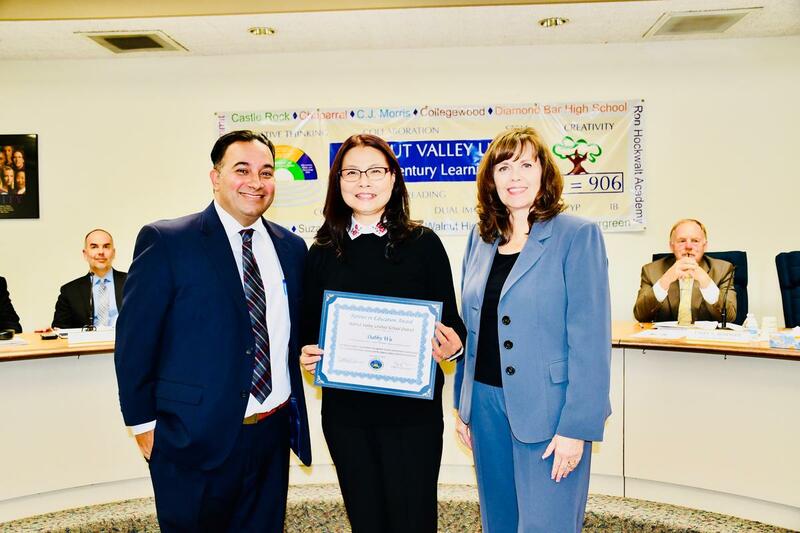 “Larissa gives 100% in everything she does and has a reputation for being the nicest student on campus,” Bhojani said. Dabby Wu of the Beauty of Sharing Foundationreceived the Partner in Education Award. For the past three years, the foundation has provided Next Generation Science Standards (NGSS) aligned environmental & nature-based education for first, second, and third graders. In addition to hands-on and engaging content, the foundation has worked with teachers to build capacity in creating globally responsible citizens who demonstrate care and advocate for the planet through their actions. First graders benefit from the Green Pet program that includes a colorful workbook, second graders learn how food gets from farm to table in the edible garden program, and third graders learn about plastic pollution and solutions. “We are thankful for the rich experiences they have provided our students!” Bhojani said. 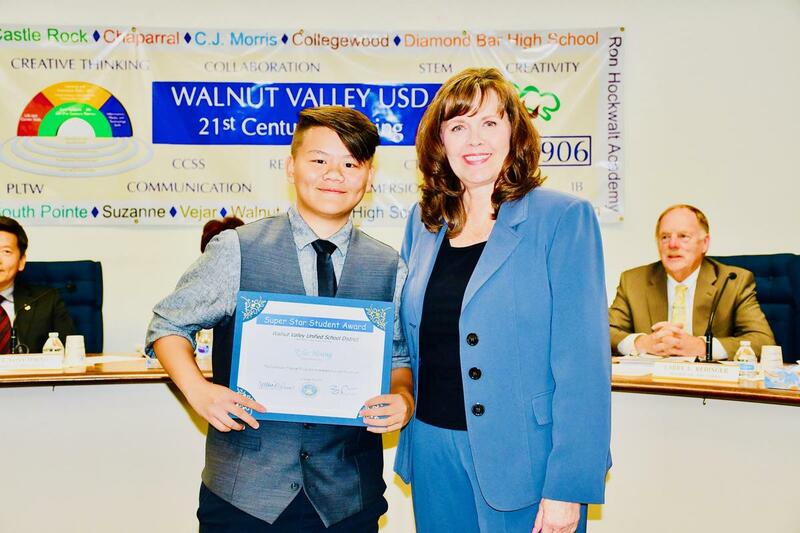 Board President Cindy Ruiz presents Suzanne Middle School 8thgrader Tyler Hoang with the Super Star Student Award on November 14. Also shown with Principal Dr. Amy Smith, Assistant Principal Matt Brummett, and family members. C.J. 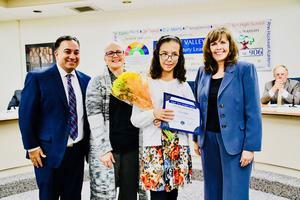 Morris Elementary fifth grader Larissa Topetereceives the Super Star Student Award. 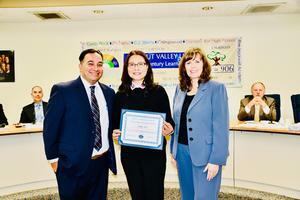 Shown with Principal Shehzad Bhojani, Teacher Rochelle Mortensen, and Board President Cindy Ruiz. Dabby Wuof the Beauty of Sharing Foundationreceived the Partner in Education Award. Shown with C.J. Morris Elementary Principal Shehzad Bhojani and Board President Cindy Ruiz.